(CBS/WTVF/AP) NASHVILLE, Tenn. - The family of missing 20-year-old nursing student Holly Bobo, a west Tennessee woman who was reportedly last seen being dragged from her home by a man dressed in camouflage, pleaded for help finding her as the community offered a $25,000 reward in the case. "Please help us find her, she's just so precious, you don't even know," said her mother, Karen Bobo, at a press conference Thursday. "I would tell her I love her and tell her to call us," said her father, Dana Bobo, when asked what he would say to his daughter. "We are hopeful she's gonna be brought back soon," her father went on to say. "I just want her back," her mother said in tears as she was carried away from the microphone, reports CBS affiliate WTVF. "We just send a plea out to whomever might be watching to help this family, We can only imagine what they go through, they need your help," said Decatur County Sheriff Roy Wyatt. The reward was announced by Wyatt, according to Midsouthnewz.com. Wyatt also said that blood had been found at the carport where Bobo was seen being dragged away from her family home and toward a wooded area. According to CBS affiliate WTVF, investigators believe Bobo may have been abducted in a home invasion on Wednesday. The Tennessee Bureau of Investigation says that her 25-year-old brother told investigators that he saw her abduction. Volunteers searched for her today on horseback, on four wheelers and on foot. Bobo is 5-feet-3-inches tall and weighs 110 pounds. She was seen around 7:30 a.m. wearing a pink shirt and light blue jeans. 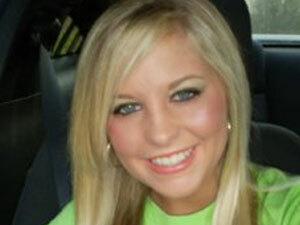 Officials ask that if you see Holly or anything suspicious contact the TBI at 1-800-TBI-FIND.